Awesome. Love stone points!! Hoping to see some cool stuff guys!! Just so happens, Im trying to get started with knapping. How 'bout that. Lots of good knappers out there and lots of folks wanting to learn. This is a great idea, Terry. Bob, I guess I'll see you in a few days. Safe travels. Pat B, I used the smallest preform today to try to figure out getting a flake across the piece. Im getting there, but I put too much into one stroke and broke off a good size chunk of a back corner. Getting started from a 90° platform is tricky. I feel like a copper flaker would work better than my antler, so I will look for a copper rod tomorrow perhaps. And glue up a good leather pad so my fingers dont get so cramped. Only got cut once! It isnt great, but I think it would do the job on an animal. Love to see this site get rolling. I watched a gentleman at the Kentucky Tradfest, did not catch his name but he broke a rock and knapped out a beautiful arrowhead in no time. That was really fascinating ! Robert, I don't knap myself but you might try getting smaller chips and going around the point a few times instead of all at once. A smaller point on your pressure flaker can help too. If you know any knappers or when a knap-in happens, watching someone else work can teach you a lot. Most knappers I know are more than generous with their knowledge and help. This will be a topic that I check everyday. I am amazed by this craft, thanks. Just started a few months ago myself. Used some chert from my land in central Missouri. Watched lots and lots of youtube videos on the how to but have yet to complete even one tip. Close but not quite. Heading to MoJam in July in Marshall Mo in hopes of finding someone there that knows their stuff to help me to complete at least one arrowhead. That's my goal to use an arrow I made to take a deer this fall with my hickory self bow. Every flintknapper I know will show you what you need to know while they are knapping so find a knapper and ask. Been in the Black Hills for a few days. Been raining so I have been knocking out some points and knife blades under the canopy. Still need to learn how to post photos. Crazy that I return to Trad Gang after a few years and find this thread. I order the Three Rivers Archery Catalog and found the flint knapping kit. Likely going to order said kit next week. One more thing to learn how to do if for no other reason than just because. Stoked to get to know you guys and hopefully learn something along the way. grasshopper: you tube is your friend when it comes to knapping. 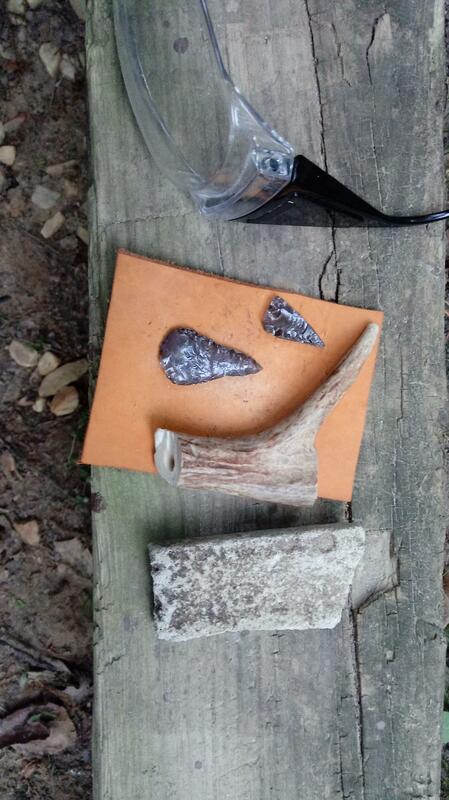 Many tutorials on knapping and how to make your tools. Welcome to the addiction. Just realized this was here. Planning on heading to Portland Oregon for the Xmas holiday and although it's out of the way I want to stop at Glass Butte and grab some free obsidian. Never knapped before but want to try some knives, broadheads. Has anyone here been out to this part of Oregon. Great thread to watch.......just started knapping myself a while back. Learning a lot watching tons of YouTube videos and it’s starting to pay off. Points are still a little small and thick though.